The number of civilian death as result of the Allied bombings has according to the propaganda machine of Gaddafi reached 718 or so. The NATO bombing machine does give us nice numbers of strikes and the objects that have been struck but NO number of victims. Other sources say that there may be a total number of 10.000 violent death since the rising in Libya in February 2011. All numbers remain vague and contested from this or the other side in the conflict. But let us be clear about something when it comes to mapping human violence. The total number of people that found their lives ending suddenly counts in the thousands. The factor may be 5 or 10 of thousands, but thousands for sure. The number of victims – collateral or not – as result of the NATO interventionist enforced change of regime, counts in the hundreds at least and the factor may be 7 or more. The number of soldiers and insurgents falling in this Civil War mixed with Western intervention is not given by any of the warring parties. And each human life should be considered as sacred – at least that is what my system of ethics says to me. The Guernica of Picasso was painted after the Nazi bombing of this little town in Basque country in 1937 during the Spanish Civil War and the involvement of German and Italian military airplanes was a clear interventionist action on behalf of the Nationalist Spanish government of General Franco, who was fighting the Republican Spanish Government. The number of victims that fell has never been firmly established, according to different sources in different times, between 400 and 1600 people are said to have been killed by this Luftwaffe bombardment, which was at that time described as a barbaric act unto a defenseless population. So what about people dying unwanted by high tech destructive devices thrown from the air in the year 2011? Is their inflicted death a barbaric act or is it not? Where is the public outcry against it. Or are we lead to believe that there are either no victims at all of NATO bombing, or that each victim is a soldier supporting dictator Gaddafi, so it is a victory for democracy when such a ‘stand in the way of democracy in Libya’ will be blasted away from the air? Comparative interventionist historical policy studies should be undertaken to answer this question. Painting by Pablo Picasso. 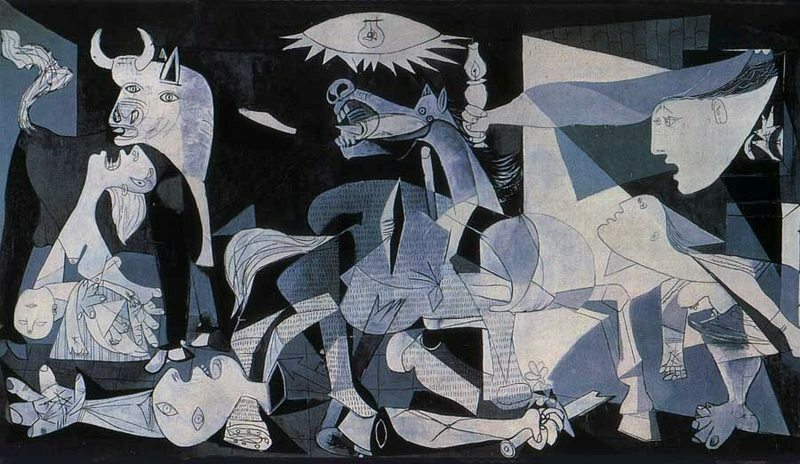 It was created in response to the bombing of Guernica, Basque Country, by German and Italian warplanes at the behest of the Spanish Nationalist forces, on 26 April 1937, during the Spanish Civil War. People who understand the rhetoric necessary to create public acquiescence know that all wars are called “humanitarian”. Nevertheless, making the threat, as the DoD has done, seems to fit the definition of terrorism. Maybe it’s humanitarian terrorism, eh? Whenever war is declared, truth is the first casualty.